If it’s time to swap your jogging bottoms for something cooler, then it’s important you pick the right pair of running shorts for you. Whether you are running track, going for a jog through the city or you prefer trail runs, there are different types of shorts that will help you get the most out of your run whilst remaining as comfortable as possible. The main things to consider are the style and material of your running shorts, closely followed by length. Runners who are training hard may want to opt for moisture-wicking material like the Nike Run Division Flex Stride 2-in-1to help keep them as dry as possible throughout their run. Whether you’re running on road or trail, comfort is your main priority. Something short with a soft elasticated waistband like the dhb Women's 3" Run Short will provide a lightweight barely-there feel for better performance. If you find short shorts too exposing, longer knee-length shorts still allow for freedom of movement, and are that little bit better on cooler days, even if only psychologically. Your other option, of course is shorts over tights – and that goes for the guys these days too. Style-wise this is SO not a hot look, but we didn't all get into running to look chic, did we? These men’s running shorts from Soffe are a great purchase for any runners who are currently in training. The quick-drying nylon wicks away sweat so you stay dry throughout your run. They have a back pocket for storing your phone or media device if you like to listen to music, and the short length means they’ll feel super lightweight. For affordable shorts that are easy to wear and easy to wash, this pair is a training session essential. Whether you’re running track or on the treadmill, comfort is always key. These shorts have a thich, elasticated waistband that allows these shorts to sit nicely on the hips without getting too hot. They’re short shorts, which aren’t for everyone, but they are lightweight and will allow for better performance on those hot, fast runs. They feature a Nike Tick on the left hand leg and come in a range of colours which make them a stylish choice for ladies. Under Armour’s longer men’s running shorts are a great alternative if you don’t like tight fitting short shorts. They provide room for movement and with the mesh inserts they remain breathable and moisture-wicking. They’re designed to be super-stretchy for high performance and they feature a special key pocket to keep car or house keys when out for your run. The reflective version of these shorts are also ideal for night time runners as they have high-vis strips on the sides. If you’ve got a race coming up, then you’re going to want as much freedom of movement as possible. These short running shorts from dhb are designed to be spacious for those longer strides. The draw cord allows you to adjust the feel of the shorts and the polyester material is quick drying so you can expect to stay cool and dry all the way round the track. Integrated odour control does what it says. 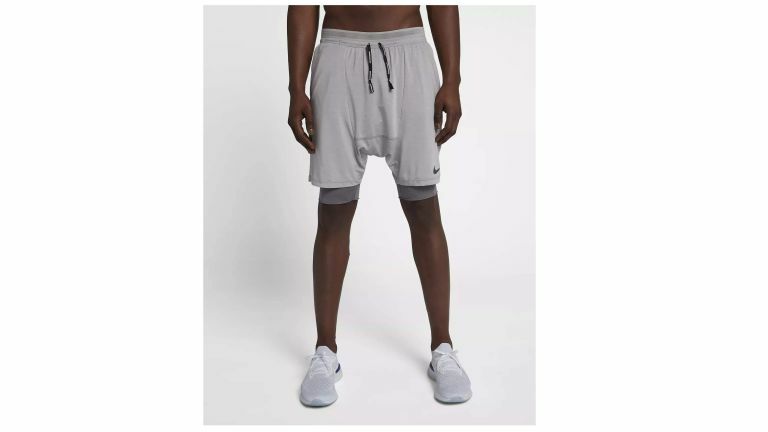 You can expect total comfort with these 2-in-1 running shorts from Nike. They are specially designed to reduce sweat but increase performance through ease of movement. The material is thin and lightweight with mesh panels that wick the sweat away during your workout. With one waistband, these shorts will feel less heavy on the body and the interior pocket has a vapour barrier to protect your phone from sweat, too. You may find that running in shorts is better for your performance, but you find you get too cold. In which case, these men’s running shorts from Asics may be the perfect solution for you. The woven material is designed to block out the wind and keep your legs insulated on your run. They have a deep pocket which is suitable for holding most sizeable smartphones, and they are stretchy for ultimate comfort, too. Users found them to be long-lasting and reliable for training. Ladies may find these short shorts are perfect for running races as they have a shaped hem for enhanced coverage of the legs without looking too baggy, and the woven fabric will ensure you don’t get too cold when running against the wind. With mesh side panels you’ll find these shorts don’t retain sweat like others, and they are fast-dry too if you happen to get caught in the rain. With front hand pockets and hidden back pocket storage, you can keep all your essentials with you and the reflective back panels make these shorts a good choice for city or night time joggers.